Princess Zeva stood before her easel, a slight frown on her face. She wasn’t sure what to do next. It was all too strange. She’d invited a few zebras over because she wanted to practice drawing portraits and patterns, so why not do both at the same time? However, one of the zebras, Zee, was acting really weird. More than weird. She had no idea what Zee was doing and none of the other zebras knew either. Right now, Zee appeared to be prancing around with a bouquet of flowers in his mouth. What for? No one knew. “I can’t draw your portrait if you’re running all over the place,” Princess Zeva said again. Zee just smiled and continued prancing. Princess Zeva looked at him again. Had he really put a flower behind his ear? How did it even stay there? She turned to look at Zee’s sister, Zen. Zen just rolled her shoulders in something like a shrug. She’d already finished Zen’s portrait, and the other zebras’ (she couldn’t remember all their names; for some reason they all started with Z) but Zee hadn’t been still long enough for her to get the patterns right. And he had pretty patterns. She had originally wanted to do a full body painting, but that obviously wouldn’t happen. Not right now, with that zany zebra prancing… had the crazy animal somehow managed to paint hearts over his rump without her noticing? Zee danced a little in front of her, his mouth a wide grin, with the flowers now sticking out at odd angles. Princess Zeva wondered what he would do next. Congratulation of concluding the challenge, Anna! It was a very good one. Not easy to come up with a story for every single day, I'm in awe of your fit. 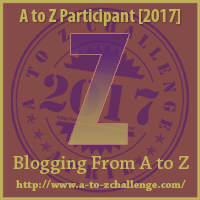 Well done for getting to Z! I have loved reading all these Princess vignettes. 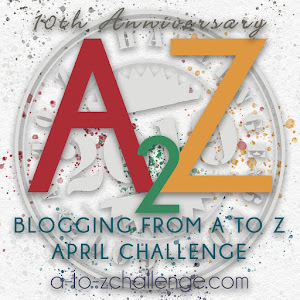 Fantastic job and congrats on finishing the A-Z challenge. That's one zebra that's loving life! Congrats on finishing the Challenge and thanks for a fun set of stories!